DependencyService is a service locator. In practice, an interface is defined and DependencyService finds the correct implementation of that interface from the various platform projects. By default, the DependencyService will only resolve platform implementations that have parameterless constructors. 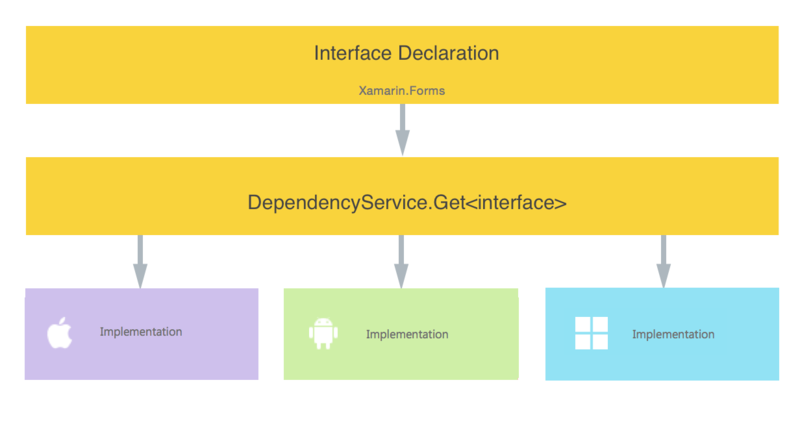 However, a dependency resolution method can be injected into Xamarin.Forms that uses a dependency injection container or factory methods to resolve platform implementations. This approach can be used to resolve platform implementations that have constructors with parameters. For more information, see Dependency resolution in Xamarin.Forms. Interface – The required functionality is defined by an interface in shared code. Implementation Per Platform – Classes that implement the interface must be added to each platform project. Registration – Each implementing class must be registered with DependencyService via a metadata attribute. Registration enables DependencyService to find the implementing class and supply it in place of the interface at run time. Call to DependencyService – Shared code needs to explicitly call DependencyService to ask for implementations of the interface. Note that implementations must be provided for each platform project in your solution. Platform projects without implementations will fail at runtime. Note: that the registration is performed at the namespace level, not the class level. UWP projects that use the .NET Native compilation option should follow a slightly different configuration when initializing Xamarin.Forms. .NET Native compilation also requires slightly different registration for dependency services. Note: manual registration using Register<T> is only effective in Release builds using .NET Native compilation. If you omit this line, Debug builds will still work, but Release builds will fail to load the dependency service. 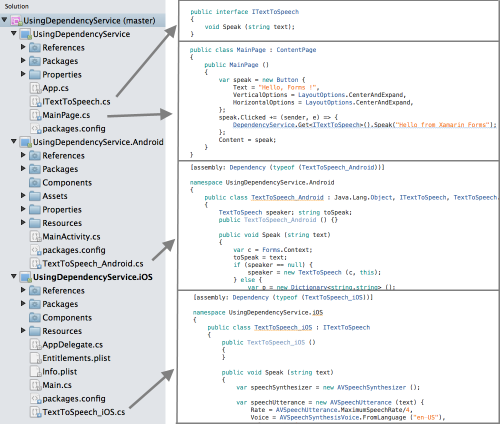 DependencyService.Get<T> will find the correct implementation of interface T.
The sample UsingDependencyService solution is shown below for iOS and Android, with the code changes outlined above highlighted. You must provide an implementation in every platform project. If no Interface implementation is registered, then the DependencyService will be unable to resolve the Get<T>() method at runtime.